BRUKS Rockwood was selected to provide complete engineering and equipment for the shiploader at the IMT terminal facility in Port Sulphur, LA, USA. This travelling, slewing, luffing shiploader is designed to load coal (petroleum coke optional) at a rate of 5,000tph (tonnes per hour). 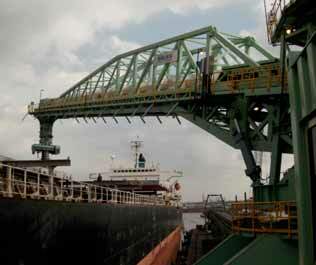 With its 150ft boom, this machine accommodates Panamax and river barge vessels that hold up to 74,000 tonnes. The telescopic chute at the end of the boom contains a trimming spoon which helps with filling the four corners of the ship hold.